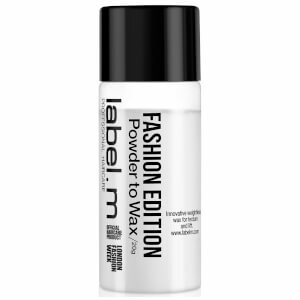 Add instant texture and definition to hair with label.m Powder to Wax, a styling clay that offers lightweight hold. The creamy formula lifts locks at the roots for effortless-looking volume without leaving any white marks or greasy residue. Hair appears artfully messy and lived-in with a sophisticated matte finish. Shake powder into palm and rub hands together to create a creamy wax. Apply to hair as desired. Aqua, Glycerin, Silica Dimethicone Silylate, Sorbitol, Pullulan, Sodium Stearoyl Glutamate, Citric Acid, Sodium Benzoate, Potassium Sorbate.